A comprehensive tour to fully enjoy the natural beauty and entertainment of Punta del Este: we will discover the city with its mix of luxury and lush vegetation, visiting the amazing complex of Casapueblo and then sip a drink in the exclusive Hotel Conrad feeling like VIPs for a day. Our tour starts from the bustling Punta del Este, one of the most famous seaside resorts in South America, popular with the jet set and undisputed capital of nightlife. An extraordinary mix of architecture, sea and luxuriant vegetation make Punta del Este a totally unique tourist destination. We head to the chicest districts where beautiful Hollywood villas are found in the midst of nature, such as Pinares, Beverly Hills and San Rafael. We also have a look at the beautiful beaches of Playa Mansa and Playa Brava with their long stretches of sand. 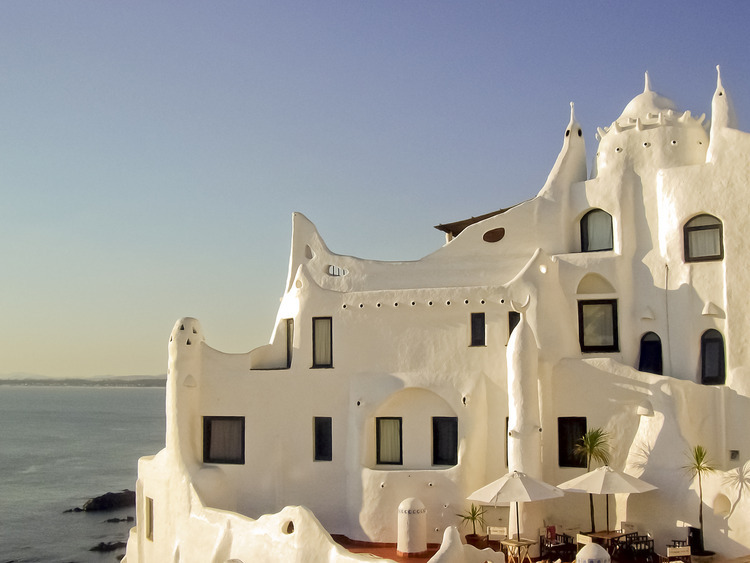 The next stop takes us to the fabulous Casapueblo in Punta Ballena, a few kilometres from Punta del Este. This habitable work art was built on a cliff by the famous Uruguayan artist Carlos Paez Vilaró and enjoys a wonderful view of the sea. It is a must see site for anyone visiting Uruguay, housing a museum, a hotel, a bar and an art gallery. At lunch time we allow ourselves a break and a little free time to stroll along Avenida Gorlero, packed with shops, bars and restaurants, ideal for eating or shopping, but also to relax on the beach, which is within walking distance. Finally we visit the luxurious and elegant Hotel Conrad, a fantastic place for entertainment, with its spectacular building that includes a Las Vegas style casino.